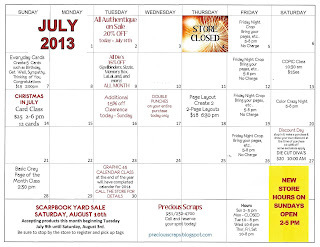 Don't forget our annual Scrapbook Yard Sale is coming up August 10th. We will be accepting items beginning July 9 until August 3rd. You must come by the store to sign up and pick up tags to price your items with. Call the store for additional details. We have been extremely busy organizing the store and making room for all of the new merchandise we receive daily. Be sure to stop in often to see the latest items before they're gone. We've added some great sales this month. Our big trade show is coming up and we need more space. If you catch any sneak peeks of the new lines be sure to let us know what you are interested in so we can be sure carry the items you love. Please note that we have changed our Sunday hours from opening at 1:00 to now opening at 2:00. This was changed in order to allow all of us the opportunity to attend church services and have time to eat a quick bite before opening. I hope this does not inconvenience anyone. 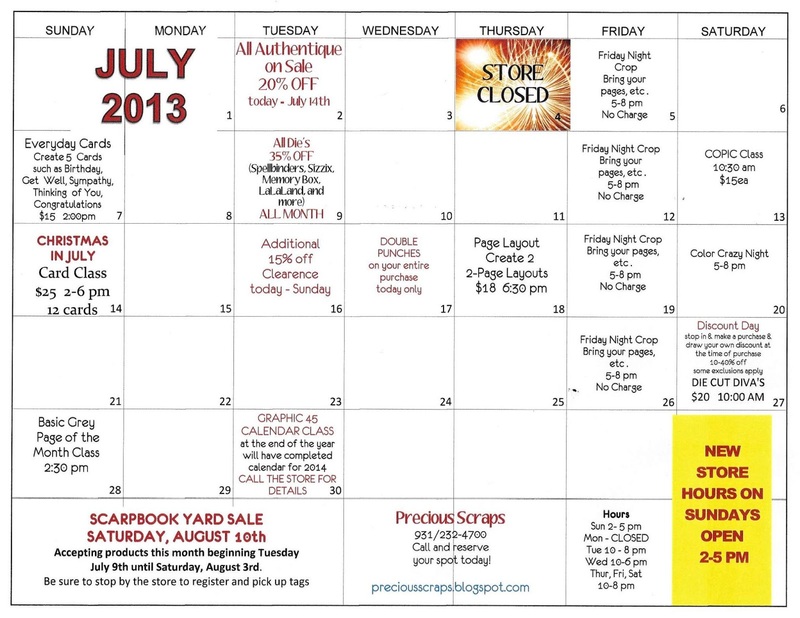 We appreciate your support of Precious Scraps and hope to see you soon. As always thank you for stopping by Precious Scraps.